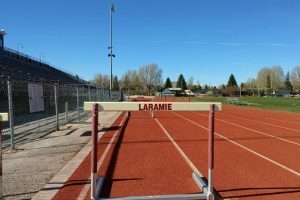 The Laramie High School (LHS) outdoor track and field team started their new season on March 4 with different events, coaching changes, and new competition. Many LHS athletes are looking forward to the increased competition outdoor offers that they don’t have in indoor track and field. “A lot of kids come from basketball, the standards for outdoor are different than indoor,” senior Ramon Gomez said. Outdoor track has many more participants than indoor. Many outdoor track events are held in Colorado which allows Wyoming athletes to compete between two states. The team will travel to four different cities in Colorado: Fort Collins, Eaton, Loveland, and Thornton. “Colorado has more people which coincides with a lot more competition,” senior Jason Upton said. Outdoor track also has different events compared to indoor track. The 55m dash is replaced by the 100m dash, the 110m hurdles, 300m hurdles, and the discus throw are added, and the 3200m race is more frequent in outdoor events. “There is 300m hurdles, which you can’t have on a 160m track and…110m hurdles which you can’t have indoors,” Upton said. “I’m going to miss that bald head,” Gomez said. The current LHS team does not have as many seniors as they did last year, which has affected the team. Liam Mcinroy, Albert Steiner, and Philip Henry were key distance runners. Sprinter Tyler Dahl was also key to the team. “That man was fast,” Gomez said. Reece Shannon, Alex Moreno, and Erik Zaft were all important jumpers for the team. Mcinroy, Steiner, and Henry contributed 58 points for LHS during the 2018 outdoor state track and field championship. Individually, Tyler Dahl contributed 21 points in the championship and Shannon contributed 11 points during the championship. These five athletes who graduated last year contributed to a total of 90/122 points gained by the outdoor track team in the championship last year. In Wyoming, less schools participate in indoor track than outdoor track. Due to less track teams around the state, LHS often gains participants from smaller schools like Wheatland and Rawlins. The team is thankful for these athletes because they often contribute heavily to the team. “To me it makes me feel good because we’re giving them an opportunity they wouldn’t have otherwise because they don’t have an indoor track team,” Brin said.